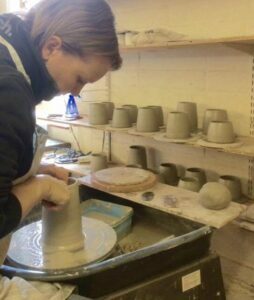 In the first of my series of Meet The Maker blogs, I chatted to the fantastically talented and lovely ceramicist Wendy Calder (who happens to live just around the corner from me) about what inspires her, what her favourite techniques are and what she would have been in another life. How did you discover your passion for ceramics? My school teacher Mr Adams was a huge influence in my O/A level school years. He introduced me to ceramics, sculpture, art history and more. He was a great teacher with lots of enthusiasm. What (and who) inspires your designs and how has your work developed over time? I’ve always loved simple forms, inspired by potters Jennifer Lee, Hannah Tounsend, Robin Welch, Carolyn Genders to name a few. My thrown work has become more refined over the years. 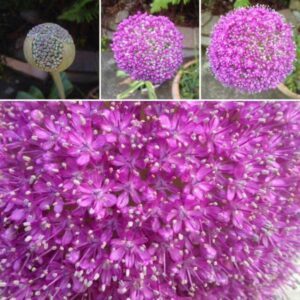 For the surface decoration I take inspiration from nature, especially my little garden when it’s full of alliums and agapanthus. I love the way they dry into beautiful seed heads. What are your favourite techniques to work with and why? 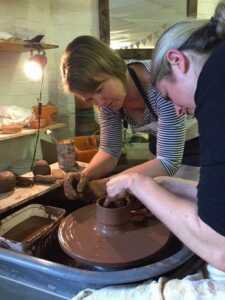 I love the motion of the potter’s wheel, the ball of clay becomes a vessel quite quickly. It’s therapeutic and mesmerising at the same time. I enjoy working with pottery tissue to create monoprints, each one slightly different in line and tone, making them unique. How important is the space you work in to your work and what makes a good workshop space? My potters wheel is situated near the window and door to our yard. I love the daylight, seeing the flowers and our rabbits who often sit at the door watching me! I love the space in my workshop, but I own up to being a hoarder and it fills up quickly! 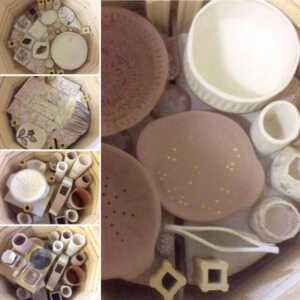 What is your favourite thing about being a ceramicist? My favourite thing about being a ceramicist is that I’m lucky enough to teach and share my love and knowledge. The variety and standard of work my students produce in the four week courses always amazes me. Plus the realisation from them that it takes patience and time to get great results. What would you be in another life if you weren’t doing what you do? In another life I think I’d like to be a travel writer…any excuse to be out on an adventure. I’d take my family, they’re the best company. Wendy Calder’s Open Studio Weekend takes place next weekend from Friday 9th to Sunday 11th November with lots of other great local makers showcasing their handcrafted gifts as well as tea and cake. All proceeds from the cake and tea sales go towards Alzheimer’s Society. You can find out more about the event and her courses and workshops on her Facebook page.